So after thinking about it in a lot of detail over a few evenings, I couldn’t quite get my head around how much 3d printed plastic was, its only plastic after all and not much more than a CNC machine. So after delving into the subject of 3d printing and getting a basic understanding of the technologies involved I found an open source project called RepRep. Whilst I loved the idea of making one of these machines it didn’t seem very easy to source the parts in the UK and I just didn’t have the time to make the machine itself so with a little luck and a need for some micro electronics I found a link to 3d printing on the Cool Components website. After an evening of reading just about every review I could find of the 3d UP! printer I found at Cool components I called them the next morning and asked if I could visit there office for a demo. After a half hour demo – which was incredibly impressive (watching a cross between a CNC and a glue gun) making a coat hanger, I delved into a box of bits the guys had played about with and saw the clip together shape in this blo photo and for some reason was so impressed that I parted with a couple of thousand pounds and was a new proud owner of a 3d UP! printer. It was a bit of an impulse buy, but after seeing the shapes and the printer in situ and some rough calculations, it turned out I could actually print all of St Pancras for about £80 that’s about a £46,000 difference! All be it not quite in the same finish or detail but that is by the by. 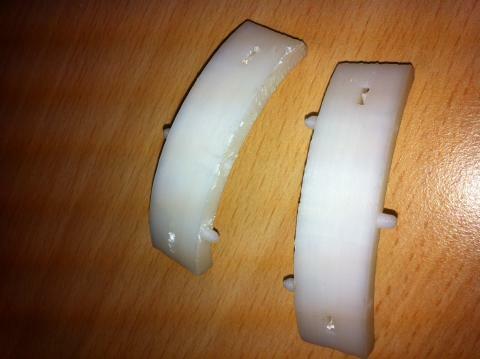 This entry was posted in 3d Printing, St Pancras and tagged st pancras cool components 3d prining 3d UP! 3d modelling.